Editor's Update October 13, 2016: We're no longer accepting signups for the Google Sites Early Adopter Program. Please monitor the G Suite Updates Blog for an announcement when new Sites launches to general availability. Google Atmosphere, Google’s global enterprise event series, lands today in Tokyo, where I’m addressing an audience of several thousand enterprise IT execs, along with our very own Diane Greene and local customers such as ASICS and Fujitec. We have two exciting announcements to share — new experiences we’re adding to the Google Apps suite, with Search and Sites. Google is no stranger to helping enterprise customers sort through their corporate information and making it more useful for employees. We’ve been a leader in Enterprise Search for nearly 15 years and have partnered with some of the largest companies in the world. 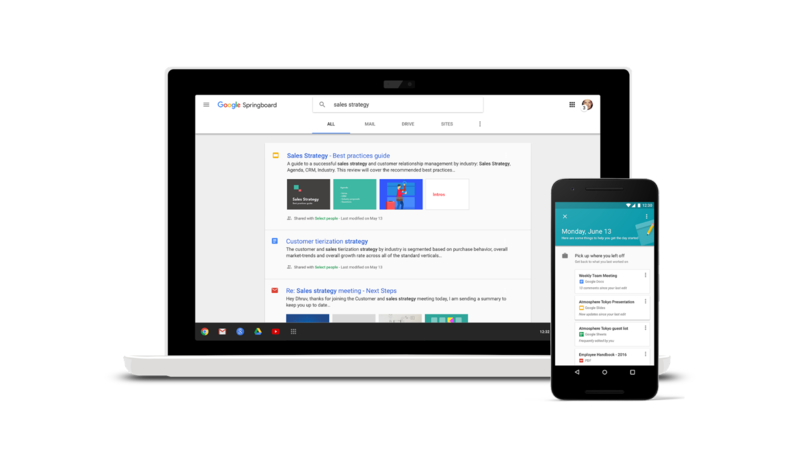 As we continue to invest in applying technologies like machine intelligence to power our web search engine, we’re working on a new way to bring all of this power to the enterprise: Google Springboard. Google Springboard helps you find the right information that you need at the moment that you need it. It searches quickly and easily across all of your information in Google Apps including Gmail, Calendar, Docs, Drive, Contacts and more. Springboard also assists you throughout your workday by proactively providing useful and actionable information and recommendations. 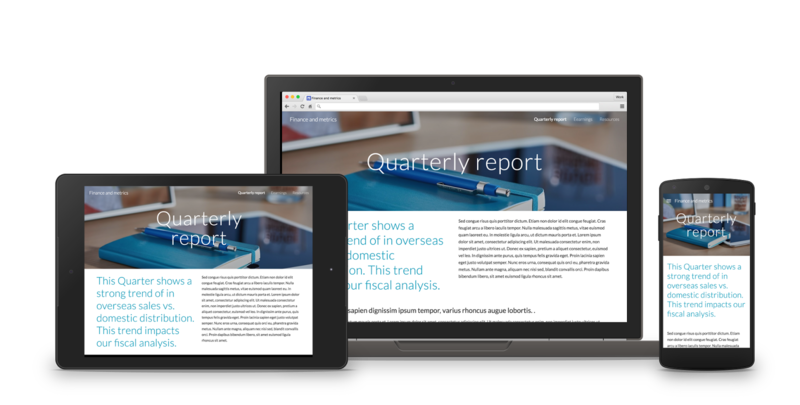 Google Sites is one of the most popular products among our enterprise customers, and we’ve been working on an update that makes it even easier for employees to share information within their company. With the new Google Sites, you can build beautiful, functional pages to aggregate and distribute content across your enterprise, optimized for every screen. A new intuitive drag-and-drop design experience supports real-time collaboration by multiple editors, just like in Docs, and offers easy access to all your content from Calendar, Docs, Drive, Maps and more. The new Sites also includes themes and layouts designed to scale and flex to any screen size, so they’re as useful when you access them on the 30-inch monitor at your desk or your smartphone on your commute. 1 Study from McKinsey states that the average information worker spends 8.8 hours or 19% of their average work week searching for or gathering information. 2 The Early Adopter Program for the new Google Sites will have no impact on customers’ usage of classic Google Sites.